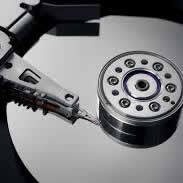 There has been an alarming uptrend in the failure of hard drives. And typically people don’t know until it is too late. Hard drive failure is not a matter of IF, but rather WHEN. We have also bee taught, “that a good DEFENSE is a great OFFENSE”. So be proactive when it comes to your data. So what are you gonna do if your hard drive crashes? I have been told from my customers, “Well, I’ll just bring it to you,Chris.” That is fine and dandy, but sometimes the data is not easily retrieved from a drive. My technicians often work miracles, but the reality is…we have our limitations. I recently had a local Mechanic Shop bring in their primary PC with data regarding all their parts, vendors, customers, invoices…EVERYTHING…and sadly weren’t able to recover it. We work closely with a clean-room in the mid-west that often can recover data in such events…but the cost would have been $1300-$1900. Another union hall that one of my technicians was at had a RAID array go bad in their server, which cost over $12,000 to fix. For some business owners that could force then out of business. RECOVERY IS NOT PROACTIVE MANAGEMENT…IT IS REACTIVE. You can download Hard Disk Sentinel. It will check the health and performance of your hard drive. The video below explains in detail. If you have any questions, reach out to us and we will be happy to assist. If you have a hard drive with an issue, we would be honored to earn your business.